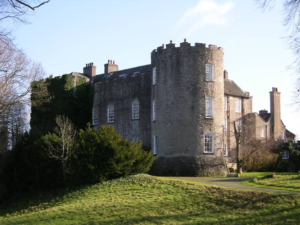 To find out more about Leixlip Castle call, +353 1 6246873. Leixlip Castle was built soon after 1172 by Adam de Hereford, a follower of Strongbow, the Norman invader of Ireland. It has passed through many hands and has been in the ownership of Mr. Desmond Guinness and his family since 1958. The Castle contains many items of antique furniture, tapestries, paintings and drawings and some unusual items. These include a large 18th century dolls’ house originally came Newbridge House, a military bath (which is in current use), a cabinet made in Killarney circa 1880 which is inlaid with views of ruined abbeys and round towers, Irish wolfhounds and with harps and shamrocks in the decoration. Also of interest are drawings of the six Mitford sisters by William Acton. A Print Room has been made in the Library and a corridor upstairs has also been decorated with prints. The garden has a conservatory and a temple and white iron gates at the far end of the lawn lead to the walled vegetable garden.